Tesco Commissions the UK's first 'above ground' station. Tesco Supermarkets Ltd was one of the first British retailers to adopt the concept of selling petrol alongside its network of super stores with the opening of its first filling station in Rochdale some forty years ago. Today the company is the UK’s number one fuel retailer with a network of over 500 sites. So far these have been conventional filling stations, all built to a design based on underground storage tanks – a tried and tested solution, perfectly satisfactory except for one significant drawback. They are by definition, fixed assets and cannot be redeployed economically as future requirements change. 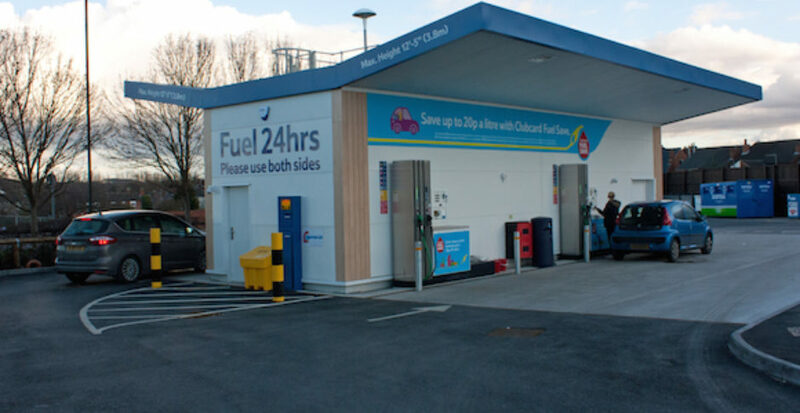 For smaller stores in locations which are unsuitable for a conventional filling station, Tesco has introduced a new generation of above ground, pay-at-the-pump filling stations. The first example has been commissioned at the Tesco Extra store in Ilkeston, Derbyshire. The concept has been developed in conjunction with storage tank specialists Ledbury Welding & Engineering Ltd.
“Whilst this practice is fairly common in the commercial haulage and transport sector, a modular package based on a self bunded tank, is a significant development for use in retail forecourt applications,” explains managing director, Kevin Powell. “Petroleum is a more volatile product than diesel and gas oil and special measures are necessary for the construction of storage tanks to prevent leakage and in particular the ventilation and safety of users and service personnel. “The main advantage is that the unit is portable. Based on our SuperVault technology, the central structure was fabricated in our factory and delivered to site, where it was installed on a prepared base. The fuel dispensers and the canopy were fitted and the entire unit fully commissioned in a single day. “If necessary it can be removed to a new location,” says Kevin Powell. The Ilkeston installation has four fuelling points; each equipped with credit card payment facilities which are common to all other Tesco filling stations. “Another important design consideration was to make operation as normal for our customers as possible,“ continues Simon White. Although it is unmanned, the filling station has bright lighting and CCTV coverage which is monitored by customer services personnel at the store. Each fuelling point has facilities for disabled people to contact customer services for assistance. An emergency telephone and fire extinguishers are also provided as an additional precaution. The pumps are used to draw fuel from the tank. Each line is fitted with an anti-syphon valve to check the flow in the event of a pump being knocked over. Crash bars and bollards are located to protect the equipment from damage by vehicles and the installation of each pump is designed to sacrifice the pump rather than the tank structure in the event of a violent collision. The Ilkeston facility has been designed to fulfil projected sales of around 100,000 litres a week. The tank capacity is 30,000 litres each for petrol and diesel. Currently these are being replenished twice a week according to demand. The module is equipped with a Driver Controlled Delivery cabinet which houses the ullage gauge (available capacity) reading, a printer unit, stop button and emergency telephone. Replenishment deliveries are protected against cross contamination by a Berry’s MIDAS (Misfuel Identification & Avoidance System). This is a crucial safeguard to prevent delivery of anything other than the correct grade for the tank. In operation the tanker driver checks the ullage status for the tank on the gauge, then connects up to the MIDAS unit at the filling point and presses the cargo pump actuation button to deliver the fuel. The printer is used to provide a receipt for the transaction – time, date and the amount delivered. Simon White concludes by saying that the crucial test for the success of the modular system will be the impact on sales within the store itself. Into Europe with the Ledbury Above Ground Modular Petrol Filling Stations (LMPF).